100% Arabica, which is characterized by a sweet honey flavor perfectly combined with notes of peanuts and blackcurrant. ALWAYS FRESHLY BREAKED in Wrocław's BLUEBERRY ROASTERS roaster! You can return the product without providing a reason within days. You can buy in installments! without leaving your home. Easy and quick like on-line shopping. 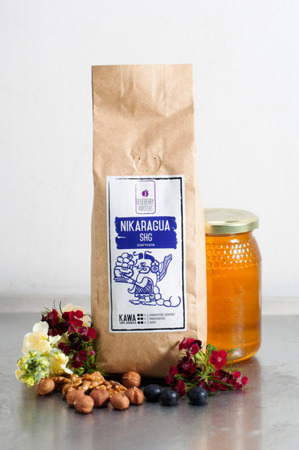 This 100% Nicaraguan SHG Arabica is an exceptionally mild and highly balanced coffee. The abbreviation SHG means Strictly High Grown and describes coffees from plantations situated from 1500 to 2000 meters above sea level. Nicaragua SHG is characterised by a slightly sweet honey taste perfectly combined with peanuts and notes of blackcurrant. Black tea and floral aromas harmonise the medium acidity of this coffee. Suitable for: all kind of brewing equipment incl. : V60, Dripper, Chemex, all types of espresso machines, etc. When it was roasted: we roast just in time, so you'll will get the very fresh coffee, just roasted for your order.